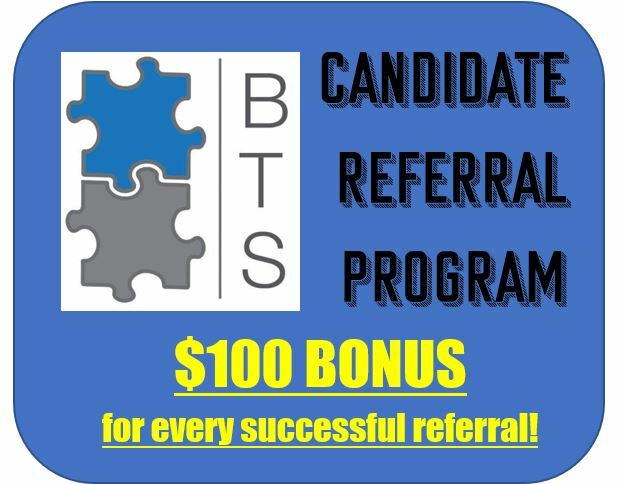 Business Talent Solutions has built a reputation for referrals, bringing both top candidates and fabulous clients together. Your referral will pay off for you now and in the future! As a Business Talent Solutions candidate of record, you are eligible to receive a bonus for each candidate you have personally recruited once they have worked the required guarantee period and payment is received from client. This bonus program is self-monitored (i.e. it is your responsibility to complete the form below and follow up after placement). Please submit the form and contact our Office Manager Robin, at robin@businesstalentsolutions.com within the first three months of a placement.